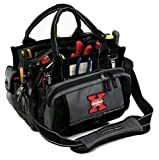 I just bought this bag for my husband who is always out working on cars or doing some kind of mechanical/electrical/plumbing favors for friends and family. Up until now, he puts all the equipment and tools he needs for each job in plastic Giant grocery bags to carry from one place to the other. I saw this bag and thought it would be great for him to use instead of those grocery bags. This bag has a place for his level, a loop to hold the electrical tape he is always misplacing, a place for a small flashlight, his tape measurer can just slide on to the front and there are so many pockets for tools and enough room to basically hold anything he needs to take with him. For what he does and the tools he takes with him, it's the perfect size - not too big and not too small. And it's got to be more comfortable carrying than those grocery bags that eventually tear on him or get holes in them. Also, it's a really nice looking bag. Very professional yet still rugged looking. My husband really liked the look of the bag and thinks he will be able to put it to alot of use. All in all, this is a great looking and very usable bag. My husband and I were both impressed when we received it. After having most of my frequently used tools lost around the house, I finally have an excellent (and big) bag to keep them and transport them in. When it is open, the top is wide and flat like a box so you can see everything. Lots of pockets. The material is tough and flexible and will last me forever. 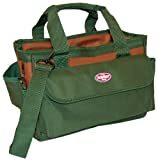 I bought this bag to consolidate some of the 4-5 toolboxes I have been using (including one of their smaller models). Even so this thing can hold quite a bit. Right now it has almost all of my carpentry tools, a set of electric tools, a few plumbing tools and various assorted other things. It basically swallowed two toolboxes I was already using. I wouldn't recommend this for the mechanic as it does not seem like it would do well with wrenches and sockets, but for the handyman or carpenter it cannot be beat. The size is great, you'll always have room in the bag to dig for tools, because it you fill it you won't be able to carry it. Mine is pushing 40 pounds of tools and I have plenty of room left. I would have given this 5 stars if they had spent a little more time designing the pockets instead of trying to say they have so many. Still if you are looking to buy this, buy it already, you won't be disappointed. 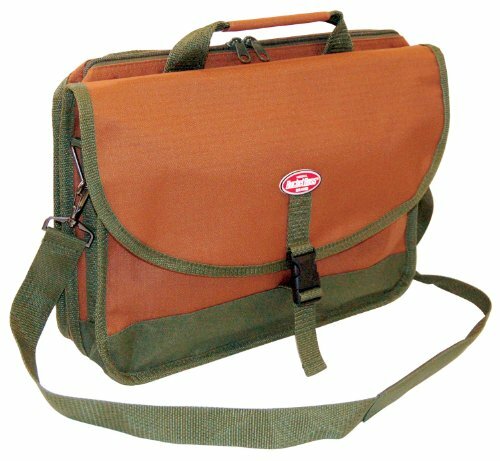 I just traded in my old reliable canvas bag for this one. It was hard to do (I love the canvas) but the extra interior space saves me a lot of trips to the truck. My only complaint is that some of the exterior pockets are pretty small. Many of them are too "tight" to use for much. All in all, a really good bag with lots of room. I've retired most of my steel toolboxes in favor of a number of these units. They're rugged, never rust, are far better organized than most steel boxes and cheap enough to devote different bags to different tasks. I have been in the trades for over 40 years, and used many tool belts. This belt is more for Western framers than Eastern, the whole debate, worm drive vs, sidewinder saws etc. If you are not used to a rear hammer holder, you will find it hard to get used to. The bags hang on your side, and not the front. These are the things I like because it makes it easy to bend over and not get pinched in the gut, by quick squares, tapes, racks of 16 sinkers, etc. 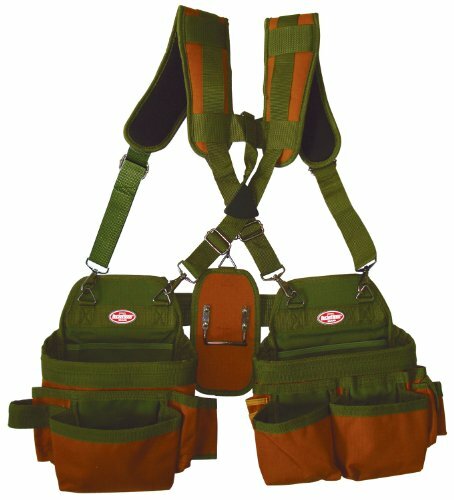 This is a great belt to see if you like the side bag system, shoulder harness, rear hammer, only $40. Good bags cost $100 to $200 for any type, so not much lost is you don't like. The reason for the 3 stars, the hammer holder broke the first week, and the x brace across the back moves during the day which pulls the bags around to the rear. I reposition everthing at lunch and start again, it's a pain. As a builder, dont expect to use this thing right out of the box as mine came squished flat as a pancake and i couldnt fit all my tools in it and still reach them because the pockets were closed from being flattened: this doesnt help when you are up on a 30' ladder. I guess you could fill all the pockets with something and hang it for a bit before commissioning it for work. I have had it a week, still stiff as a dead fish and wont break in- but im expecting it to anyday now. I also think the hammer in the back stinks as i am used to a traditional tool belt with the hip hammer loop and this thing has none. Would be a good belt for someone just starting out as you can get used to all its little annoyances from the get-go, as a full time carpenter forget throwing your old belt away for this one. I used this belt for an hour and put my old one back on. The material is pretty rugged and its seems to be constructed well- the shoulder straps are also really comfortable. My overall opinion is: bad belt layout and i want my hammer on the hip which you cant have with this belt. 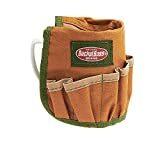 Let me first start off with that first I am a professional builder, and have at times a need to carry a full assortment of hand tools on the job where a tool bag or cart simply will not do. The option of hauling two full tool bags on my waist all day long becomes a bit uncomfortable. I saw an item like this in the store for $20.00 more that I tried on and like it. I got this one but did not like it because it had too many straps which made it hard to get on and off. I also thought that the number and placement of the straps made it easier to get snagged on things. The one that I saw in the store had a "Y" strap where this one has and "X" strap to support the tools, the "Y" strap was a little less padded which made it less bulky and the straps where little more sturdy which made them keep their shape beter and easier to get on and off quickly. I liked the one in the store better also because the tool bags hanged better and the clips that hold them where smaller in size but strong and less in the way. Even though it cost more in the store it was a better buy for me considering these small but important features to me. It is hard to avoid the conclusion that the people who designed these knee pads never wear knee pads. They are very disappointing, although it would be very simple to make them better. 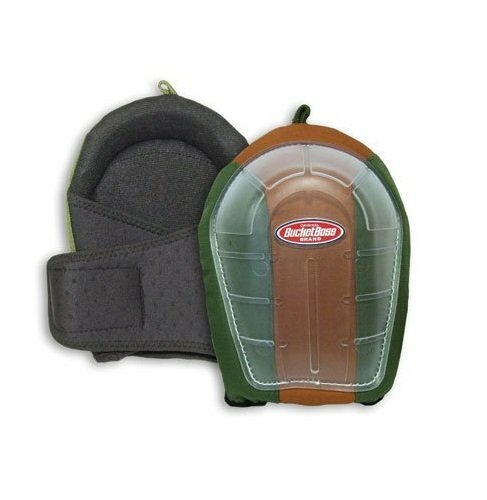 The problem is that the curve of the knee pad is very shallow, and the gel pack is a single pack, not molded to the shape of a knee. Consequently, the knee rolls around on the pad which is almost as hard on the knee as not wearing pads. If the gel pack were shaped so as to cup the knee snugly, they would be fine. As it is, they are little better than a simple pair of pads that I bought for $9.00 in the garden store. My Dad went into landscaping late in life and it's a job he loves. He also loves all the toys that go with it. Minus the knee pads he could never find a pair that stayed up or in place. Very comfortable. Can work for hours on concrete floor and not have any pain. Highly recommended. I've been carrying my Bucket Boss briefcase on a daily basic for two years now, and it still looks new. It may be designed for contractors, but there are plenty of features that make it perfect for computers geeks as well. There's room for a laptop, of course; a special pocket for a cell phone that lets you hear the phone ring, tons of pockets for pens, pencils, screwdrivers, pliers, a digital camera, books... whatever you need to carry. It's rugged, looks good in almost any setting, yet doesn't attract the attention of thieves like the typical laptop case or fancy briefcase. Highly recommended. ...this would be a perfect bag. It wants for a zipper under the main flap for the primary compartment. In its existing state papers get wet in a rain storm. I was looking for a replacement for my Lands End briefcase [I've had three of those but I'll never go back]. One of my complaints about the last one I had was that it was navy blue and things like my black cell phone would get lost down in it [along with other things]. With only a few small but deep pockets inside, there wasn't a good place for the phone, and things tended to get very disorganized. I'm a clinical psychologist with 3 offices [and a home office] so I tend to carry around a lot of junk, including charts, other papers etc. and with the Bucket Boss I'm no longer always rooting around trying to find something that I tossed in there. In my search, I looked at other canvas bags that could take the beating of all the moving about that I need to do - the Lands End ..., the L.L. Bean case ... and one from Duluth Pack ... but I saw this one in the ... Tool Crib catalog for... and it kept intriguing me - in part because of the lighter color, which I thought would help with being able to find my "lost" things. At that price there seemed little to lose but boy, was I pleasantly surprised when I got it. The pictures and text do not do it justice. It has tons of pockets, places for pens, wallet, checkbook...you name it. I've used it for over a month now and I can't find anything I'd change in the design, nor any flaws in the construction. In fact, I love it so much that I'm going to order a "replacement" now, so that when I wear this one out I'll have one already. My only qualm in doing that is that it is so well made, it may never wear out, but I'm sure my heirs will be able to put it to good use long after I don't need it any longer. Good for Light work ! I wouldn't buy any other toolbelt. I am on my third "contractor's rig". I have something stuffed in every pocket. I re-hab old houses and I do more things than just carpentry. 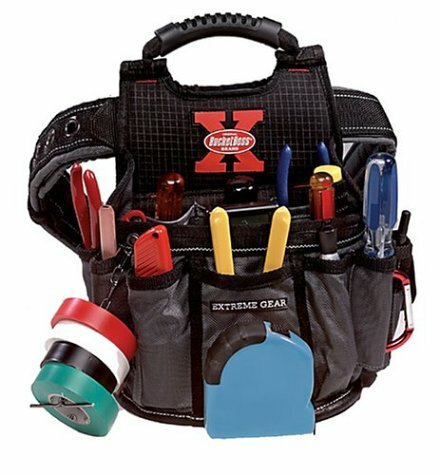 I carry a framing hammer, nails or screws for the job, screwdriver, pliers, cold chisel, awl, nailset, utility knife, crescent wrench, miniature screwdriver, 5 pencils or markers, razor blade scraper, electrical tape, 2-prong plug adaptors, electrical connectors; latex gloves, sandwich bag of misc. fasteners, paper towels, paint can opener, wood dowels, end nippers, wood chisel, nail claw, (2) voltage ticks, flashlight, 25' tape, some other odds and ends, and safety glasses. I like a toolbelt that is lightweight so I can pack around more tools. I like the Contractor's Rig having so many pockets... it has spoiled me for any other toolbelt... I am always on the lookout for a toolbelt with more utility, but I haven't found it yet. I have to use padded suspenders from Nailers with it because of the weight (and to attach my cell phone to), but, the belt is not all that easy to attach suspenders to. I have a 32" waist, which means the two bags, the tape holder bag, and two hammer loops (sometimes I carry an extra hammer or prybar) pretty much fill up the belt for me and still keep the bags off my thighs and to the side when I climb ladders or work on my knees). 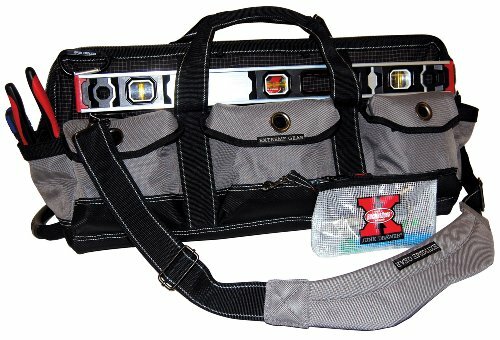 I have had to make repairs and sew up the toolbags a few times, but if you are using a toolbelt every day it is going to suffer wear and tear. The hammer sleeve makes a great place to store safety glasses. Im a helper with a crew that does rough framing and have been using this rig for a little over a month. Overall I am satisfied with the belt, especially the price. A helpers pay won't afford one of those $100+ setups out there. Each pouch has a nice big pocket that can hold a ton of nail clips even if you have a bottle of water in there, which you need in this south texas heat. When I first got it I had to switch around the left and right pouches. I like the one with the two fastener pockets to be on my left. They work out great. I keep a small supply of hand drives in one and cap nails in the other. The third nail pocket on that pouch keeps concrete nails, but its hard to get my fingers into it. And theres no way a human hand can fit down there. Having that speed square pocket on the left is nice to. The tape holder doesent seem like it would work well. And every time you look down at it you wonder how in the world your tape hasnt fallen out yet, but it works great. Its nice to not have your tape taking up pouch space. My tape has never fallen out - (a 25') but I don't think it would hold a 35' well. The hammer hanger is excellent and works way better than the hammer sleeve. That hammer sleeve DOES NOT protect your leg. My estwing beats the heck out of my leg if I keep it in that sleeve. The right pouch has a mammoth pocket just like the left one. And it also has three small pockets inside it that hold my knife, torpedo level, and pry bar perfectly (wish I could keep that bar somewhere on my left though). The middle pocket (which I didnt even notice for a few days) holds a chalk line like a dream. The bottom most pocket I dont have anything in but its nice to have that storage space. I like to keep the big pockets for nail clips. There are a great many places to put pencils but no pencil pockets where I REALLY want one, its not a big deal though. The pocket that has the covered flap works well to hold a short ratchet action screw driver I have. The nylon is much tougher and resistant to tears and punctures than I thought it would be. No need to baby this rig. The belt itself is comfortable (once you get it adjusted where you like it) and unless you are really loaded down with stuff you don't really notice your wearing it. I can't comment on whether or not this would make a good "contractors" rig but it sure makes a great "helpers" rig. 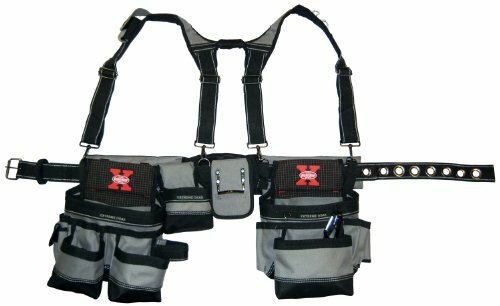 I would definitly recommend this belt to anyone that needs a good rig but doesent have a ton of cash to spend. My advice is to pass on this tool belt. [After two months of use] this tool belt is coming apart at the seams with VERY light duty use[...]. I doubt it would last a week as a "Contractor's Rig". In addition it has been a pain to use since day one. The belt simply will not hold its position, if you buy this tool belt plan on occasionally wearing it around your ankles. Also, the front nail pockets flop around dumping their contents as you walk, kneel down, or climb ladders. 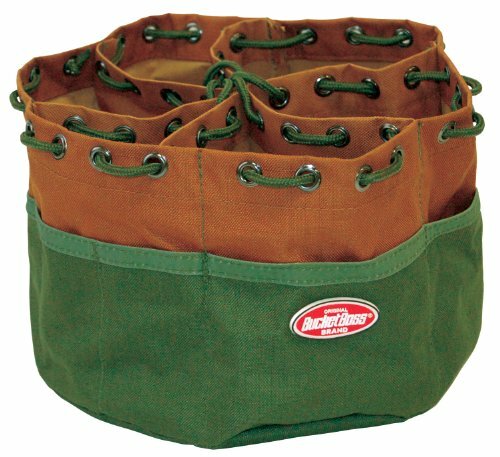 I own other Bucket Boss items that have proven very durable and useful. In my opinion they missed their usual high mark on this one. "Contractor's Rig"? I don't think so!! My advice is to pass on this tool belt. I received this item on April 9, 2002. It is now June 6, 2002 and this tool belt is coming apart at the seams with VERY light duty use (just as another reviewer mentioned it's the stitching at the tool slots). I doubt it would last a week as a "Contractor's Rig". I got the Gatemouth bag as a gift from my son two years ago. The bag looks great, has lots of pockets and sure seems strong. I use it to carry emergency tools in the truck of the car. I have not overloaded the bag. I was very disappointed when the stitching on one entire end panal failed and the bag literally fell apart. I've tried to find warranty info or company contact for this item but have not been able to find anything. The company is owner by Fiskars but I find no support for the Bucket Boss line on their web site. There's a possibility that I had a bad bag. I liked the bag so much while it functioned that I am ordering a replacement. I hope this was just a fluke. The design sure seems just what I need. The company really should stand behind the product though. Lots of space to accomodate stuff. Strong, lightweight and useful. But you can get a Sears version fo about half the price. Three years and still going. . . .
25% Larger - Will hold a reciprocating saw. Giant ergo-shoulder strap - Easy on the body. Hidden stash pocket - Keeps your stuff secure. Junk Drawer - Great for storing all those odds and ends. Cell phone pouch keeps the phone close at hand. Organize bolts, screws, wire nuts, etc. Great set of stackers!! Compartments are big enough to hold a 1# box of drywall screws. I use one for nails, one for screws, and one for electrical fittings.. Haven't found a use for the 4th one yet.. I had a chance to check out the smaller ones (Yellow) (when they were sent to me by mistake) and I HIGHLY recommend going with the larger ones (Red).. 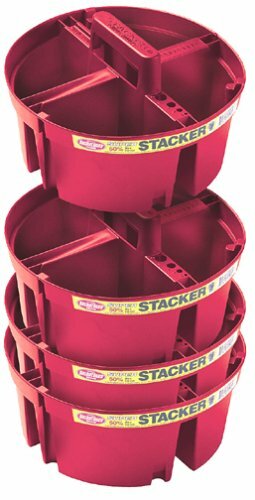 I'd rather have a stacker only filled 3/4 full of screws than to have a smaller one overflowing.. Just waiting for Bucket Boss to make a Stacker Lock that secures to a stepladder tray so you can't inadvertantly knock it off the ladder.. When I'm on a job, I can need 15 different types of nails and screws-easy. I used to keep them in the lumberyard bags stashed in a 5 gallon bucket. Now let see where is that bag with the 3d finish nails? I know it's in here somewhere. Right, usually the last bag I'd look in. I bought two sets of the stackers-one for screws and one for nails, and those unproductive search minutes have become a thing of the past. My only complaint is sometimes a lower stackers will come out with the upper one and then fall off, spilling its contents. Aw, quit your belly achin'. Pouch measures 9.75 in. x 5.75 in. Great tool carrier. I put it on when I start work and leave it on all day. So comfortable I forget to take it off. Not bulky or heavy. 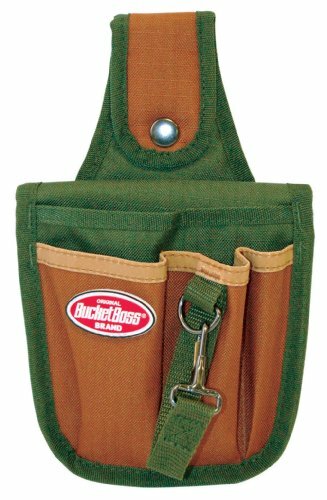 Keeps hand tools handy without putting on another tool belt.A lot of pockets for such a small thing. Held up well for mechanic! It's a great item for my mechanic husband, it saves his pants pockets from getting holes in them from his wrenches & screwdrivers. It took him a couple of days to get used to it, but now wears it every day at work. UPDATE: my husband wears this daily at work, filled with his tools. No area showed any sign of wear after 2 years of constant use. His screwdriver finally wore a hole through the pocket and we purchased another one. Got a great 2 1/2 years of use out of this! Im a service electrician, so i do small jobs all day long and in between im in the truck driving to the next job ,so i put tools on, put tools away all day long. I got tired of putting holes in my back pockets by carring screw drivers ect.. my regular tool pouch is big and hangs on my belt so it was too much of a pain to undo my belt when i arrive and then again when i leave. This baby solved that problem. I ended up using it in my front pocket, more comfortable and excessable. It did wear out in 8 mo. 's so im ordering a new one. if they beefed up the bottom of pouch so screwdrivers wouldn't eventually pop through i'd give it 5 stars. 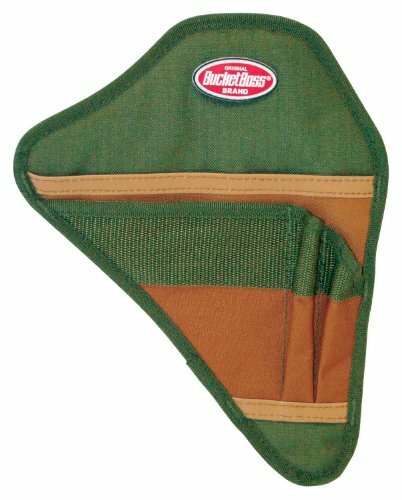 Excellent pouch for electricians who usually put there pliars & screwdriver in back pocket. You can fit pliers,strippers,2 screwdrivers& tester. Downside; it only lasted about 6 months. Most of the time my desk is cluttered with one job on top of the other. I keep thinking a credenza would solve that problem but it doesn't. The frustration is when you need a letter opener or a pen, and they are buried in the pile. Or I need the mini razor that slides back in the plastic holder. That baby really lays flat, and can get lost under most anything. This Mug Boss is great for all of those problem. Pens, pencils, letter opener, and whatever else you may use on your desk, are always at the ready. It looks really cool. Has a handy look to it and hints that things are under control. Great material, sure to last a long time, and fits a standard size coffee mug. It's cheap. Buy a few and give them out to your friends. It's an upfront desk reminder of you. Great conversation piece. I really don't see any down side to it. Makes a great compliment to the Bucket Boss, and the rest of the line. Highly recommended. Clever little gift. Fits over any coffee mug or short glass and all your pens, pencils etc fit right in. Functional as well as clever. I bought one of these for each of the 25 office staff and they love them. Visitors to our office always ask where they can buy them. A great deal for only a couple bucks. Not that practical! But cute! You don't need it, but you must have it. 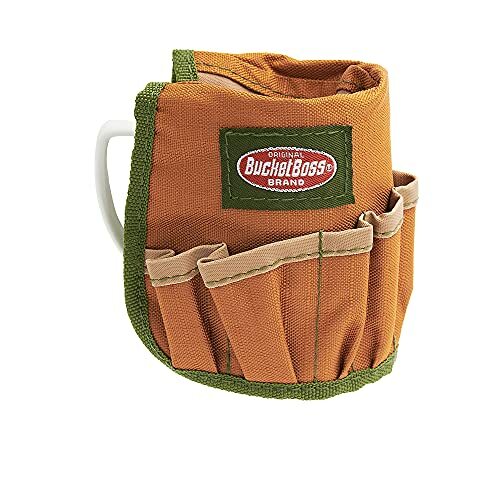 Two ugly coffee mugs will do the same job, but how cool is your accountant's logo and maybe a Local 1030 Environmental Workers of NJ mug gonna stack up to a BucketBoss? Look, you worked hard to get off the jobsite and into a chair. You wear shirts with buttons. You have a slight crease in your pants. Your shoes are relatively clean. But you still remember eating lunch out of a box, wearing work boots, and having your own nicked-up hardhat. The BucketBoss lets people know you still know how to kick someone's behind for slacking on the job. And it keeps the pens separated nicely from the pencils, and doesn't let the Sharpies get mixed up with either of them. The S/H charge drops it from cute to a joke. This set of four stacker system, with four compartments each, has greatly aided me in trying to keep my shop organized with the various screws, nails and brads that I use in my craft business. Each compartment is labeled and I know that the exact item that I am looking for is in the "screw" bucket. It has eliminated the boxes of stuff from piling up on the workbench. Better yet, when I go off to a craft show, I just take the bucket with me, and I know I have everything in hand that I could possibly need. Plus, when the supply of a compartment gets low, I know it is time to fill it up, rather than hunt through the various boxes on the work bench hoping that I have more. I do have to watch the amount of hardware I put in the containers. Too much weight tends to make them a little "too flexible" and difficult to handle. A great "investment" and time saver for me. Most pouches don't come with a good place for a square and the darn things are always falling out or poking you in the ribs or something. This scabbard is well made and clips onto a pants pocket with a metal clip or it can be slid onto the belt using the loops on the back of the scabbard. The extra pouch and pencil slots are nice too. The material looks nice and is very resistant to wear, damage and fluids. I heartily reccomend it if you carry a sqaure often. After getting tired of scraping knuckles in a large pouch, tearing holes in pants pockets, and trying other products, I have found a product that works. The scabbord does just what it says. A left handed model would make this a 5 star product. It's functional, easy to find your square/tape/pencil without having to look all of the time. It's also very durable, a definite PLUS. As a hobbyist, I look for products that will give me a lifetime of service, easy to work with, versitile, and dependable. The Layout Square Scabbord does all of this. I'm very pleased with this product.